English | Kraft durch Häkeln ! … for the Trümmerfrauendenkmal (monument to the ‘Rubble Women’) is intended as a homage to the women whose contributions were decisive in the rebuilding of Berlin after WWII, and to all women around the world whose contributions are of the utmost importance in building and maintaining the fabric of society today. 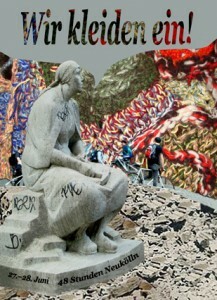 These still current realities provided the artist Amy J. Klement with the impetus to dress the today little known stone sculpture by Katharina Szelinski-Singer in a wool dress to which more than 110 individuals have contributed during numerous Anarchic-Crochet-Circles since November 2008. The action culminates in a textile installation during the 48 Std. Neukölln festival in June 2009 at the site of the monument of the same name in Volkspark Hasenheide in Berlin-Neukölln. The monument to the Trümmerfrauen will be dressed in a performative action in a patchwork-like crocheted wool dress for 28 hours. This action is accompanied by further simultaneous performances in which the public is also invited to participate. 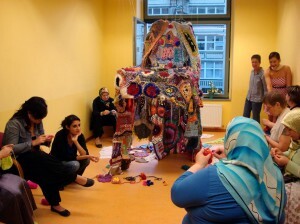 Once again an Anarchic-Crochet-Circle full of color and joy. preparation for the dressing of the sculpture during the 48 Std. Neukölln Festival in June 2009! 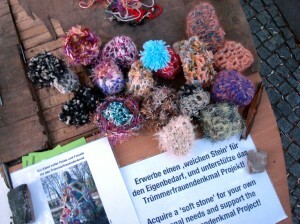 Click here for more info about Anarchic-Crochet and the Trümmerfrauendenkmal Project.